Meditation is a journey within. It is the process of developing a relationship with yourself, and truly getting to know yourself, of stripping back the layers of expectations that have accumulated since birth, and finding out who you truly are. It is a very personal journey of self discovery, and everyone’s journey is different. So why embark on this individual and intimate journey surrounded by other people? Surely that is paradoxical? Over the years I have found the benefits of meditating in a group to be profoundly beneficial, exhilarating and life changing! 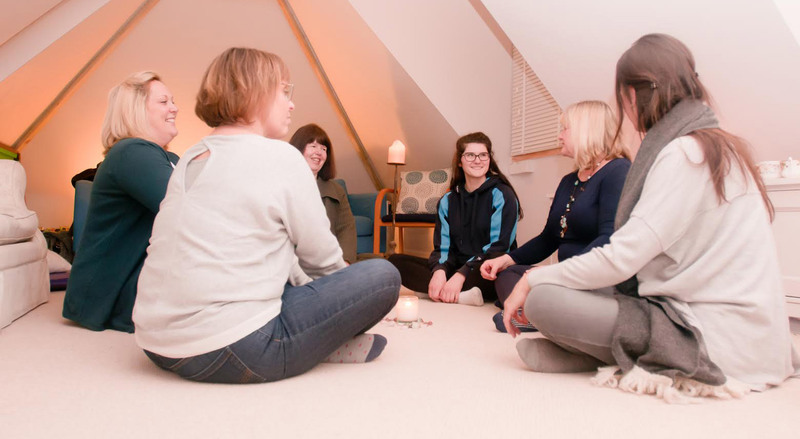 My positive experiences encouraged me to become a teacher myself, and the groups and workshops I run on a regular basis here at Haney’s Holistic Wellbeing, continually give me a deeper understanding and belief in the power of group meditation. It is easy to find excuses not to do something on your own, such as meditating, but when you find a group you ‘click‘ with, and enjoy being with, it encourages and motivates you to continue to develop a consistent practice. Attending the group on a regular basis can become part of your social calendar and a way of meeting like minded people and sharing experiences. Sometimes, especially when we embark on a spiritual journey, it can feel quite lonely and bewildering but meeting up with a regular group who are also starting their journey can be both stimulating and inclusive and it is fun to share the path together, rather than alone. Many people who come to my groups, share with me the fact that the group inspires them to practice regularly, as without it they would probably fall off the wagon! The longer they come for, the more their practice deepens and they start to reap the benefits in their everyday lives. We humans are social animals, and as a rule we tend to thrive in communal group environments where there is a collective feeling of ‘being in this together‘ . By learning and growing together we can develop a real connection and harmony and take inspiration from shared progress. It is comforting to know that you can share experiences and feedback with the group if you want to. Many different experiences can arise during meditation, and being part of a group allows you to share any struggles, insights, joys or ‘light bulb‘ moments that you have. Often, when people first come to my groups, they are very quiet and reserved , but as they weeks go on, and they become familiar and comfortable with the energies of the group and what to expect, they begin to open up like flowers in the sunshine and this is so rewarding to observe! Even if you do not want to share your experiences with everyone else, you can still feel a real sense of connection by tapping into the same silence and source of peace. Recorded EEG results have shown that brainwaves synchronise when meditating, bringing to life the familiar saying “on the same wavelength“! The Power of Collective Energy and Intention This power is awesome and really has to be experienced to be believed! When a group comes together, to meditate with the same intention, to learn and grow together for their own and the collective good, the energy is palpable! At the start of each of my groups, I always take a moment to ‘check in‘ with the energy in the room. People arrive and bring with them their fears, their concerns, their anxieties and stresses, their joys and their sorrows . As the session develops I can sense and feel a change in the atmosphere. Slowly and gradually the energy settles down, then starts to amplify and rise. I can sense the consciousness changing within the room and I feel we are creating a safe, warm, cocoon-like bubble of positivity, calm, harmony and deep peace and at some level this is vibrating out and having an influence, no matter how small, on the greater consciousness. This is so rewarding for everyone, and cannot be found in an app! When we finish a session and everyone leaves, I always take a minute or two to soak up the positive atmosphere and energy that has been created by everyone in the room, confident in the knowledge that they too will take a drop or more of this inspiring essence back out into their everyday lives. So, if you have contemplated meditating in a group situation, but have been unsure, I urge you to give it a try and here are a couple of tips. Seek out different groups and find out a bit about how they operate. There are many different types of meditation, ranging from Mindfulness, to Zen Buddhist to Transcendental. Make sure the time of day suits you, also the regularity with which they meet. Don’t be frightened to ask questions before you go along, and make sure you are happy with the answers. Try different groups until you find the one that resonates with you! Make sure you like the teacher/ guide who is running the group and that you feel comfortable with them. Every teacher has a slightly different style but it is important that you connect with the person teaching you to enable them to guide you on your journey. Whichever group you decide on, try not to go along with preconceived expectations, but instead with an open heart and an open mind. These really are the only 2 requirements you need for your meditation journey! Good Luck! If you would like to find out more about my workshops or the regular meditation sessions I run, please get in touch with me through the contact page.